We are excited to announce that The SPCA of Winchester, Frederick, and Clarke Counties has been selected to be part of the MARTIN’S Bags 4 My Cause Program, which is designed to make it easy for customers to contribute to their local community while supporting the environment. 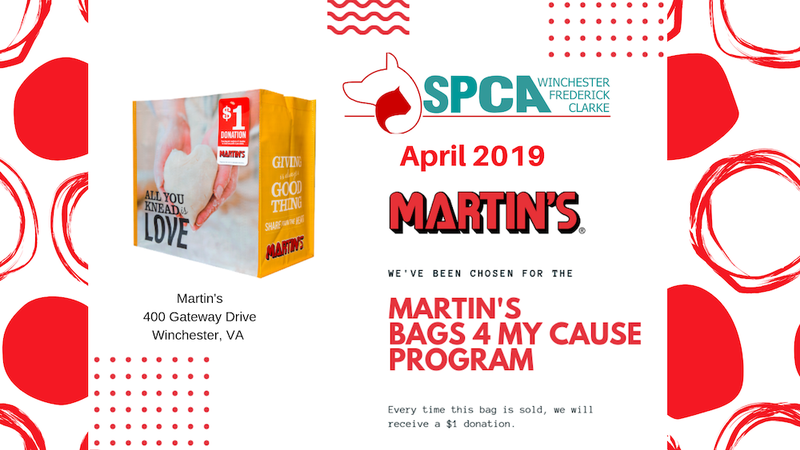 For the entire month of April, each time a reusable Bags 4 My Cause is purchased at MARTIN’S located at 400 Gateway Drive, Winchester, VA, $1 will be donated to the Winchester SPCA. We appreciate the support you give, which has allowed the SPCA of Winchester, Frederick, and Clarke Counties to maintain the work we do in our community. The MARTIN’S Bags 4 My Cause Program is a great way to continue to support the homeless animals in our community while working to eliminate single-use paper and plastic bags. Imagine if each one of our Facebook friends purchased just one bag. WOW! What a difference those funds would make to the homeless animals in our community. Please share this event and help us spread the word and pass along this exciting news! Discover Love at the Winchester Petco. 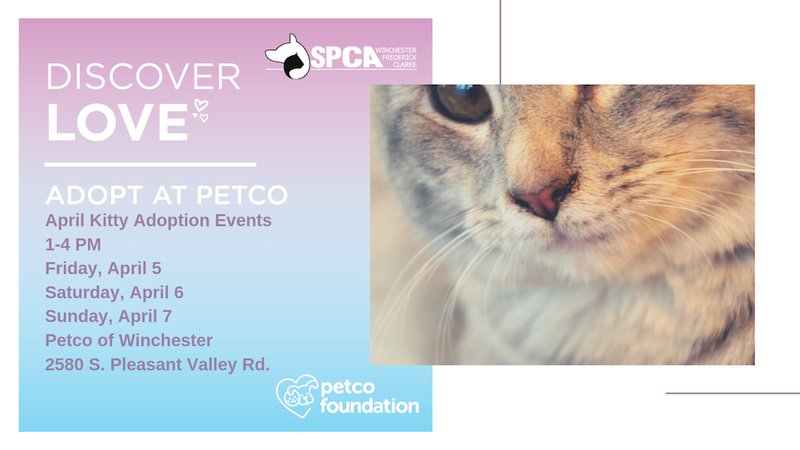 Kitty Adoption Events will be held April 5-7 1-4PM at the location on Pleasant Valley Rd. Stop by and meet our team members and see some fabulous kitties! 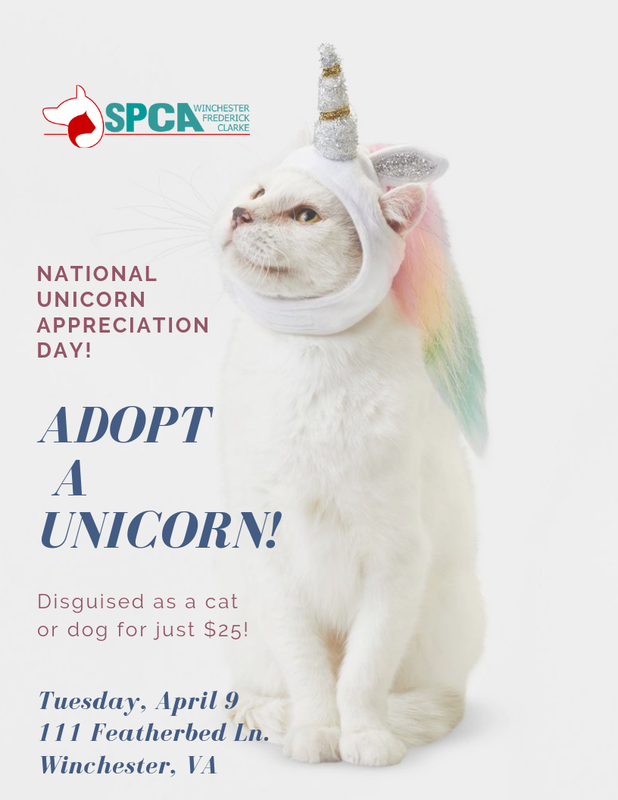 In honor of National Unicorn Day, you can adopt a unicorn (disguised as a cat or dog) for just $25. Own your very own unicorn from the SPCA of Winchester, Frederick, and Clarke Counties. Tuesday, April 9th 10AM – 5PM. 111 Featherbed Lane. Free Unicorn Horn with every adoption. All unicorns are spayed/neuter, microchipped and have age appropriate vaccinations. Disclaimer: No dogs or cats were really turned into unicorns but they sure do look adorable. Keep watching for great unicorn horn pics. 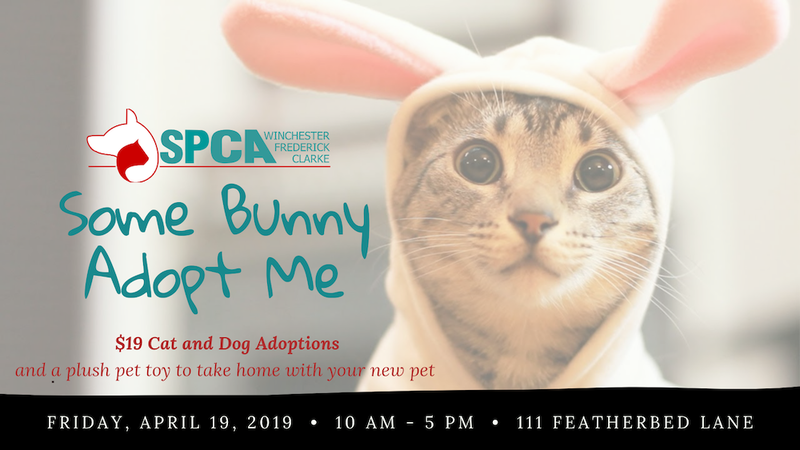 Adopt from the SPCA of Winchester, Frederick, and Clarke on Friday, April 19th 10AM – 5PM. All cats and dogs will have a $19 adoption fee which includes spay/neuter, age appropriate vaccinations, microchip, flea/tick treatment. Each adopter will also take a home a plush bunny pet toy for their new family member, a complimentary vet visit, and a leash or carrier.